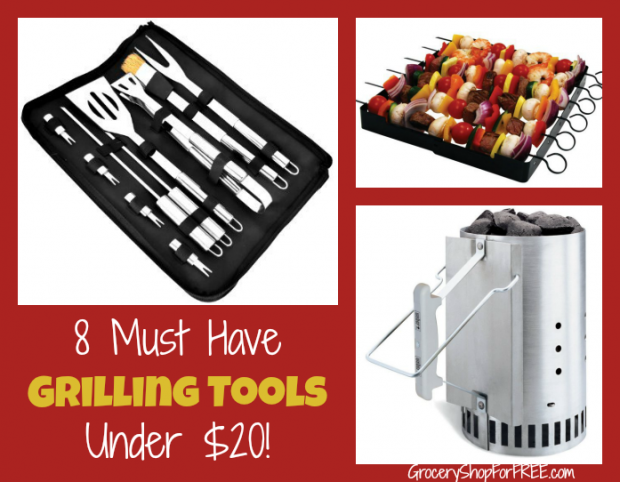 8 Must Have Grilling Tools Under $20! 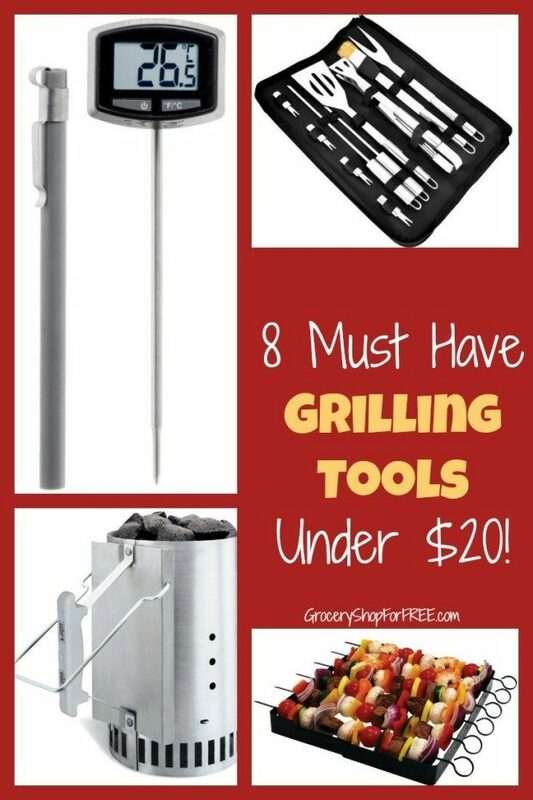 You are here: Home / Great Deals / Amazon Deals / 8 Must Have Grilling Tools Under $20! Summer time is grill time! Make sure you have all the tools you need to have the best grilling summer ever! Start with a clean grill grate and all your grilling will be easier! 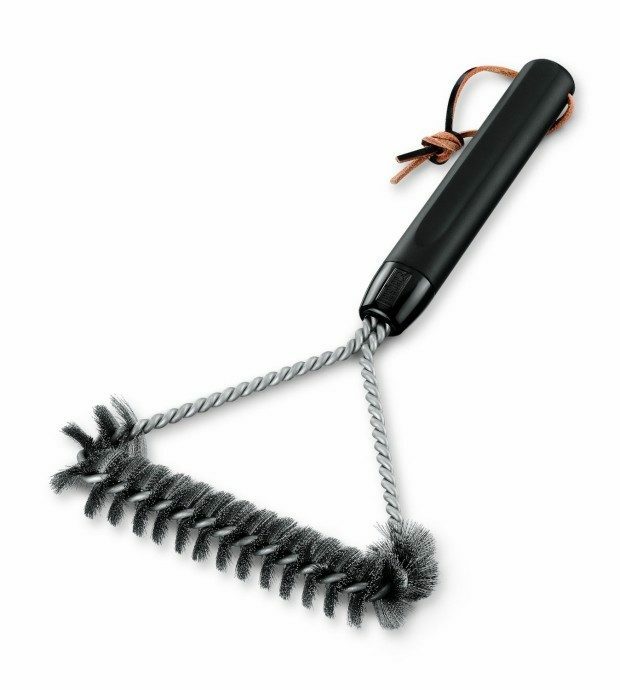 The Weber 6494 12-Inch 3-Sided Grill Brush easily cleans hard-to-reach spaces. It has an ergonomic handle so you can grip more easily and the stainless steel bristles are extra thick for a longer life! Get the Party started by firing up the charcoal oh, so easily! 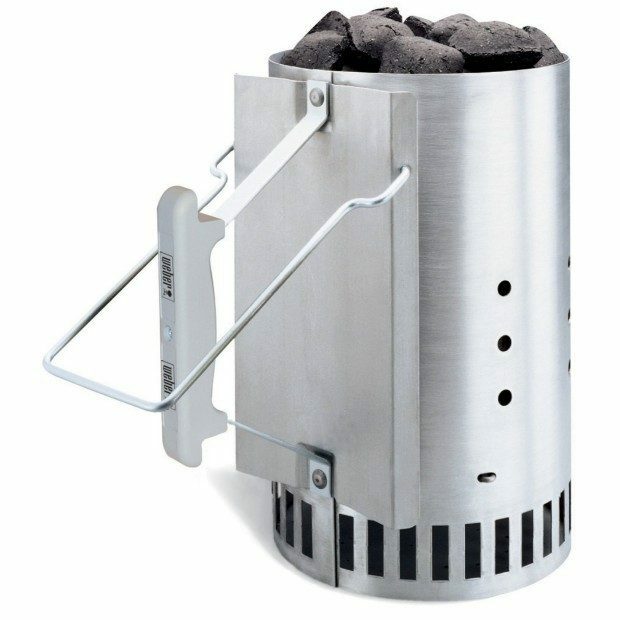 The Weber 7416 Rapidfire Chimney Starter lights charcoal quickly and evenly. The Chimney holds enough briquettes for a 22-1/2-inch kettle grill. Made from aluminized steel with a stay-cool thermoplastic handle, it has a cone bottom to ensure fast starts and eliminates the need for lighter fluid! 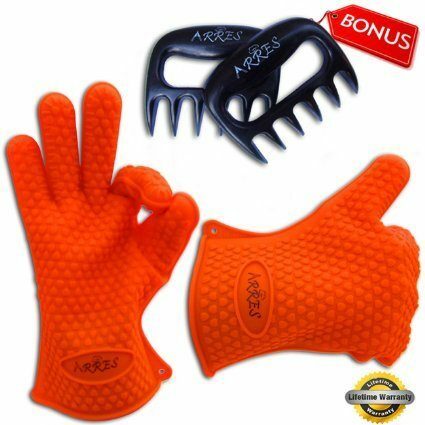 Make sure you protect yourself from burns with the Heat Resistant Silicone Glove Set for Cooking, Baking, Smoking or Barbecue. Comes with bonus meat claws! These gloves protect you up to 425 Degrees Fahrenheit and allow for a stronger grip than a regular oven mitt given by their tiny hearts – No more dropping the pans: grab the handles securely due to the 5 fingers shape. Unlike fabric oven mitts, you can use them to pick food from boiling water! 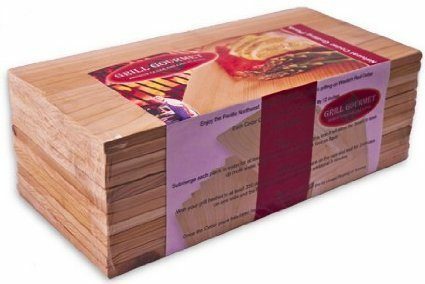 Add some extra flavor to your food by using these Cedar Grilling Planks! You get 12 planks measuring 5.5″ x 11.00″ x 1/3″! with Grilling Instructions to teach you how to use them! Make sure you have the utensils you need with the Grill King Stainless Steel Grilling Utensil Set. 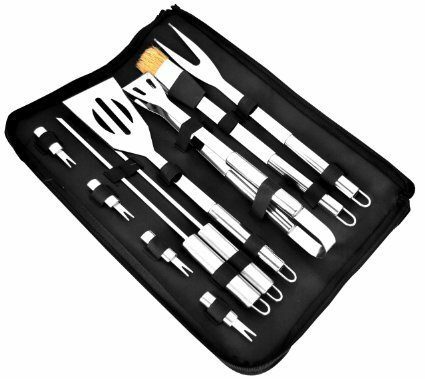 This 11 piece set has tongs, fork and spatial along with special items for different needs! 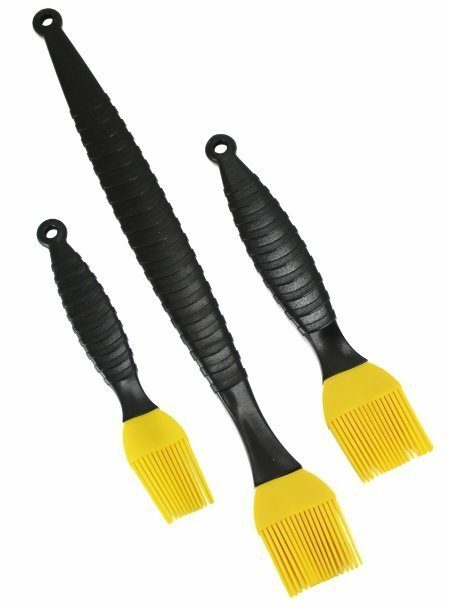 Silicone Basting Brushes are a must have. The heat resistant nature of these brushes means you can use the right on the grill with no problem! The set includes brush in lengths of 7.5″, 8.5″, and 14.5″ and a wide of 1.5″. The silicone heads can snap on and off handles for easy cleaning. I love shish kabobs but they are tough to situate on the grill without falling through to the fire! The Brinkmann 9021 Shish Kabob Set eliminates that problem. The space saving unit holds up to six skewers of food and the design ensures stability; for use with ovens, grills, or smokers. 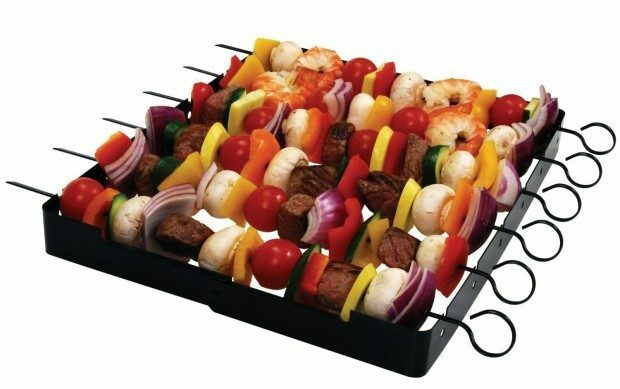 The set is easy to clean and includes stand and six skewers! Make sure you know when your food is done! 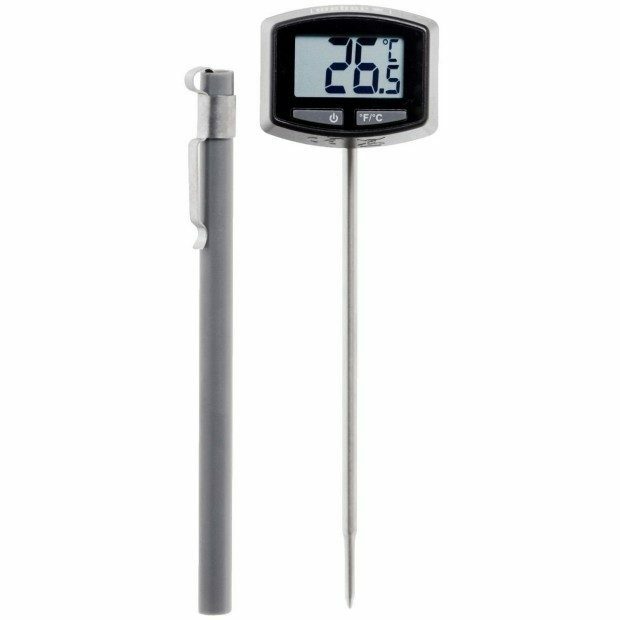 The Weber 6492 Original Instant-Read Thermometer has a digital display that reads temperature quickly. The swiveling head rotates for easy reading and this thermometer has an auto shut-off after 15 minutes! This should fuel your summer of grilling!